Comark Refrigerator/Freezer Thermometer. 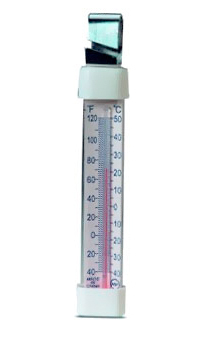 Unique 360° swivel mounting bracket allows thermometer to be hung from a shelf or fastened permanently in any refrigerator. Non-toxic spirit filled solution. 5/8" x 4-5/8" (2cm x 12cm). -40°F to 120°F range. NSF certified for commercial use. The EFC120C is an economical way to be sure your food is being stored safely in a commercial application or a home refrigerator too.